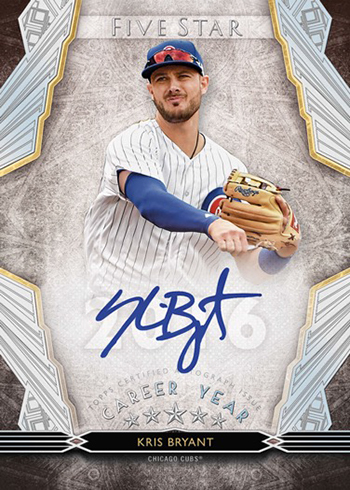 2018 Topps Five Star Baseball ($139.95 per box) arrives Wednesday, October 17th at Sports Cards Plus. 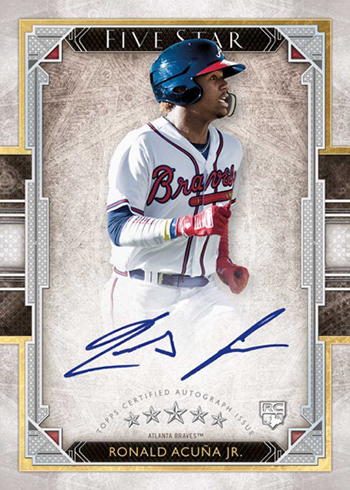 Topps super premium brand with a checklist that’s virtually all on-card autographs (only cut signatures aren’t) delivers two autographs per box. In the days before Transcendent, Definitive and a couple of other ultra-premium lines, Five Star was the top of the Topps baseball portfolio. Although Topps Five Star has a moderate price tag, the quality of the cards are still very much on the super premium. The Base Autographs consists of more than 50 players for the checklist which includes veterans, rookies and retired stars. Parallels are available in six levels: Purple (/50 or less), Blue (/25 or less), Green (/15), Gold (/10), Orange (/5) and Red (1/1). Silver Signings and Golden Graphs both return, each getting their names for the signatures’ ink colors. Layouts for both are similar, using black as a backdrop to help the autographs pop. Parallels come in Purple (/25), Blue (/20), Green (/15), Gold (/10), Orange (/5), and Red (1/1). Five Star Signatures all have print runs of 20 or less. Some of the horizontally designed cards also have inscriptions with short notations from the player. Five Star Dual Autographs come with signatures from a pair of players. These aren’t easy to find with each numbered to 10 or less. 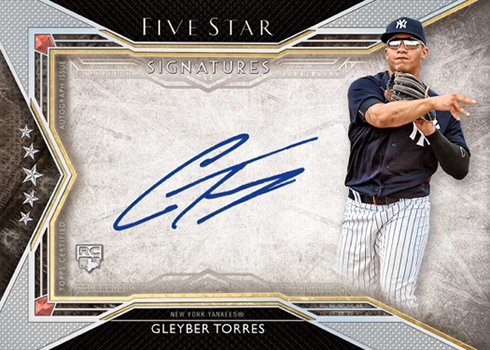 Career Year Autographs are new to 2018 Topps Five Star Baseball. Numbered to 25 or less, these note the player’s best season as a thematic element. Five Star parallels are one-of-ones. For premium memorabilia collectors, there are Five Star Autographed Jumbo Patch cards. All are numbered and have a large patch piece along with the on-card autograph. Parallels start with Gold (/25 or less) and Silver Rainbow (/10 or less). These also have four different one-of-one versions: Laundry Tag, Majestic Patch, MLB Silhouetted Batter Logo, and Team Patch. Cuts come in two forms. Five Star Cut Signatures have autographs from all-time greats. Celebrity Cut Signatures highlight big names from outside the sport. No matter the form, all are one-of-ones.